Book five in the End Street Detective Agency series written by RJ Scott and Amber Kell. Diverse Reader - 5 stars "...Amber and RJ have one of the greatest series I have ever read here. I’m so deeply enthralled and in it to win it with these folks! 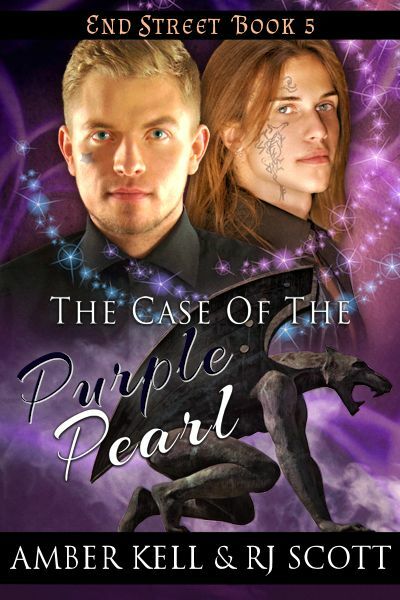 The Case of the Purple Pearl is everything you look for in a mystery fantasy and so much more. Grab this whole series and hunker down. It’s amazing!" Bayou Book Junkie - 5 stars "...Star-crossed lovers, Fae Royalty, curses and spells and a whole list of paranormal characters this is definitely the hardest case Sam has seen so far. If you're a fan of The End Street Series you have to pick up this latest book. I highly recommend!" I just re-read this a couple of days ago. Ya know, in anticipation of Wed.